While others substitute plastic, Fluid Faucets continue to use brass to ensure their lifetime warranty means something. The meticulous curves, unique angles and mirror-like polished surfaces of fluid faucets are unmatched. Imaginatively designed and crafted by artisans, every fluid line brings style to life. 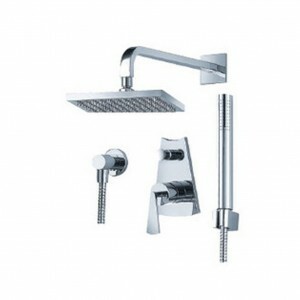 Includes: Trim with Handle, Rain Shower Arm, Rain Shower Head, Tub Spout and Hand shower.